In comparison to the outgoing model, the redesigned Audi Q5 SUV is all set to amaze the enthusiast and with its updated styling. The SUV is fully redesigned with a long list of standard features that make it a fantastic luxury compact SUV. In response to 2017 model’s criticism, the 2018 model comes up with an updated infotainment system and better driver assistance features. The Premium Plus model begins at $46,475, top-line Prestige model starts at $51,775. The fully loaded luxury crossover SUV can touch the $57,000 mark. 2018 Audi Q5 comes up with an updated engine for the base model. This 2.0-Liter mill produces 250hp. Transmission duties are taken care by a 7-speed dual clutch automatic transmission. Audi Q5 has naught to sixty mph time of 5.8 seconds. It offers a comfortable ride and has athletic handling with little body roll as you take corners securely. EPA ratings for the Audi Q5 are average. Audi Q5 makes abundant use of upscale, soft-touch materials. The seats of the car are very comfortable and supportive in both rows. Cargo space in the car is above average for the class. Such feature embodies the kind of luxury for which Audi is renowned for. Other features include heated front seats, heated steering wheel having shift paddles, four-way lumbar support and many more. The car has two complete sets of LATCH systems in rear seats which help in securing child seats. The car has many other features including Apple CarPlay, Android Auto, rearview camera, voice command, two USB ports, Bluetooth, and push-button ignition. It also possesses Audi Pre Sense City which gives pre-collision warning. The updated handwriting recognition feature is easy to enter the destinations into the navigation system. The 2018 Audi Q5 SUV is longer, wider and taller in comparison to the old model. This model follows an aggressive new styling. 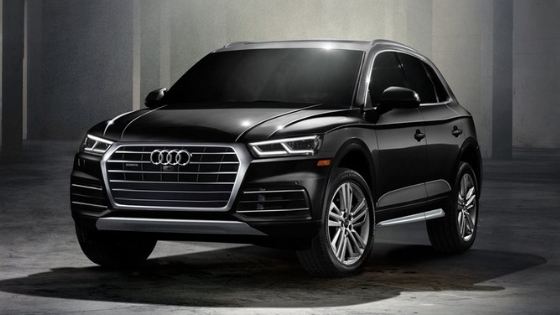 The exterior design of Q5 has come up with more detailing on the hood and dominating character lines which runs from the headlights and wrap around the rear. The side view mirror has more angles and is in proportional to the rest of the exterior design. The new design is more modern and fresh in look. The bonnet is distinctive and so is the gently sloping roof line. Wheel arches are strongly defined. Rear lights are present with dynamic turn signals. Audi Q5 has improved features almost in all ways as compared to its predecessor. The safety score for a car depends upon ratings given by IIHS (Insurance Institute for Highway Safety) and NHTSA (National Highway Traffic Safety Administration). Safety features for Audi Q5 include airbags for front & rear head, front & rear side. The car has 4 wheel anti-lock disc brakes that ensure complete safety of the passenger and driver. The 2018 Audi Q5 offers outstanding performance, modern style, and is embedded with latest features and technology. Considering its modern features and technology it is worth to spend approx. $50,000 (prices vary from model to model) to own this beauty. Q5 gracefully balances comfortable and smooth ride that is a striking feature to attract sport car fans. Overall, there will be no regret if you purchase an Audi Q5.